We are a leading Wholesale Trader of bollywood vol-3 ladies suit, fancy dress material, ladies suit, ladies suits, patiala salwar kameez and anarkali gown from Surat, India. We are a rapidly growing organization engaged in manufacturing a wide gamut of Ladies Suit to our clients. Apart from this, we are providing these suits in various colors and sizes and also can be customized as per clients given requirements. Backed by our team of qualified and experienced professionals, we are engaged in presenting our clients a wide range of Ladies Suit. Apart from this, our clients can avail these suits from us in diverse alluring colors, attractive patterns and styles as per the individual preferences of our valued clients. In order to meet the diverse requirements and preferences of our valuable clients, we are able to supply Patiala Salwar Kameez in the market. These salwar kameez are crafted and designed using optimum quality basic material and threads to ensure their premium quality and durability. Apart from this, our well qualified professionals have used creativity at its best to give unique patterns and vibrant colors. These salwar kameez are also delivered to the clients at reasonable rates within the stipulated period of time. 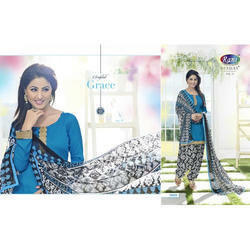 Our prestigious clients can avail a vast assortment of Ladies Suits from us with ulmost quality.